FIRSTLY: In 99% of all my past bagel-encounters I found a whole bagel to be simply too much for me. The sheer mass of it, as well as lacking variety in taste. Having eaten the first half of it, the whole thing starts to get “old”. Across the board I hate to just stick with a single flavor for the duration of a meal, same here, there are so many wonderful spreads out there, it’s virtually impossible to appease my cravings by choosing one single flavor to go with two bagel halves. Generally, if available, I always opt for the smallest portion of a snack, which makes it easier to indulge in the many flavors and tastes. ‘Love to sample without making commitments, so to speak. Voilà, this is where the mini bagels come into play. Three to four big bites and they are history, allowing to taste different spreads and toppings without being completely stuffed. SECONDLY: The hole. Ok, ok, I won’t blame the bagels for their holes, but certainly inapt staff at bagel shops for doing a poor job trying to turn the bagel into a well dressed, good looking and especially, edible – technically edible – bagel. I’ve had so many that after the second bite automatically morphed into a “run over” kind of style, with the cream cheese spread all over the place making the bagel a complete mess to eat. While this might be taking it too far, the mini bagel with the smaller hole – unless you go crazy with the filling – is a so much nicer snack. They can be true all-rounders and are definitely a worthy candidate for my next party event! Mix flour and salt in a large bowl and make a little depression in the middle. Then pour water and olive oil into the depression and sprinkle dry yeast on top. Cover bowl with a kitchen towel and allow to rest for about 5-10 minutes. Either use your kitchen machine or knead by hand until the dough becomes smooth, shiny and elastic. Add some more flour if it feels too sticky. Again, let the covered bowl rest at a warm place for about 60-90 minutes (size of dough should have doubled by then). Preheat oven to 200°C (392°F). Punch down the dough, and shape about 16 to 20 equally sized little balls. Now comes the fun part: You can either use your index finger (poke it in flour first) or the handle of a wooden spoon to create a hole in the middle and try to give each bagel a nice look. Be sure to make the holes a notch larger than you’d think is necessary, they tend to quickly close up as the bagels rise and bake. Heat up a pot of saltwater and bring to a boil, reduce heat and let simmer. Send bagels into the hot water for about a minute (they’ll float on top) and remove with a skimmer. Imagine wrinkled fingers after a long hot bath – yep, that’s what they look like now. Note: You could now brush some egg yolk over the bagels to give them a darker (and more yellow-ish) color. We tried with a few and found the original color to be much nicer looking. Sprinkle with sesame, poppy seeds or other seeds/spices of your choice and bake in the oven for about 10 to 15 minutes or until golden brown. Once cooled down a bit you can serve right then and there, but they also taste phenomenal the next morning, straight from the toaster with cream cheese and jam. Home-made jam of course :) Throughout last year, my family went a little overboard preserving jams and jellies (and other) – this is what we got just this Christmas… Sour cherries and blood orange are my new favorites – so far. Prep time: 30min., rising time: ~90min., baking: 10-15min. poppy seeds, sesame seeds etc. Ah! This post has just sent me down memory lane. My mom and I used to make homemade bagels and pretzels when I was kid. It was always so much fun. Thanks for helping me end my day on that pleasant note. Plus, I haven't eaten a bagel in years; that might change now. Ils sont si mignons !!!!! ooooooooh, sooooooooo cute!! I've been thinking about making bagels again for about.. the last six months... :-) But now I'm definitely convinced! You are so right about the bagel size, I hardly ever finish one. The first picture has to be the cutest bagel I have ever seen!!! They look so sweet ! Das Größenproblem kommt mir sehr bekannt vor, nicht nur Bagels auch viele Sandwiches sind nur mit Hängen und Würgen ganz zu bewältigen! Deine kleinen Bagels dagegen sind schon wieder fast zu schade zum Reinbeisen. Oh what a good idea! I miss bagels so much from the days I was living in NY. I never thought I could make them myself, I thought you needed special flour or something. Thanks for a great idea! I love food in miniature portions, they're so delicate but also very delicious and fun! I'm delighted to see you were inspired by one of my favorite books! Fingerfood has been a great source for parties and such, the recipes are straight forward and never fail. And these minis have been on my list for ages! That is really cute. That's how I'll make them when I make them next time. Also, I use sugar water to boil mine in - ends up looking the same though the colour may be just a shade darker after the baking. You're right, these are also great the next day, toasted, with cream cheese! seit meinem allerersten Bagel in NY bin ich abhängig! Ein weiteres Problem der großen Bagels - wie ich finde - ist die Tatsache, dass man wegen der vielen Arbeit mehr macht als man wirklich braucht, und mir schmecken die Dinger einfach nur frisch (jedenfalls nicht aufgetaut). Das ist bei dieser Größe ja kein Problem - die schaffen wir doch locker an einem Tag!!! Danke für die Idee und das Rezept - und was die Marmelade betrifft: Ich würde dir gern ein Glas selbstgemachte Physalis-Konfitüre schicken (wenn du mir sagst wohin). http://www.stviateurbagel.com They have been making the round breads since 1957! Aber ich frage mich, warum man die Bagels denn in köchelndes Wasser gibt? I love everything mini, mini muffins, mini egg tarts (a Chinese Dim Sum pastry), and a few days ago, I stumbled upon some mini baby bok choy. What a great recipe for bagels! I've seen them made on television, but have never tried making them myself. Yours are so cute and yummy-looking. Your photos are so beautiful--truly mouth-watering. Are they all taken in natural light or do you have some kind of professional lighting setup? Oh oo My..Those bagels look so lovely! Feel like I am going to hurt them if I bite. This is perfect for my birthday party in February, thank you so much! Hi-just wondering what brand of yeast you are using? I live in Germany as well, and have yet to find a brand that I am happy with. Thanks for your help! Those are perfect looking bagels. I've decided to give bagel baking a try because our favorite bagel shop just closed down. Although mine didn't look as perfect as yours, my kids went nuts over these!! Thank you so much for the recipe and inspiration! I rarely manage to eat a bagel without making a complete mess - yours however seem to have the perfect size! 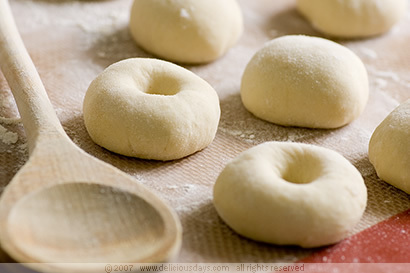 One question: Do you think the dough can be made in advance and kept in the fridge over night? These are awesome! I love bagels, but as a nutrition student I'm starting to feel guilty about the size of some of them now. I'm not a bagel fan as a rule, but your dinky ones look great. I agree. These bagels are adorable!! No bagels here in Marrakesh. ~sigh. Adorable, i really love the small size idea, thank you for this recipe! Thanks for the recipe! I made them last night and they were v. v. tasty. Next time, I shall make them slightly bigger, but they were so yummy this morning with butter and honey. Oh my God Nicky!!! These are the cutest things ever! Would love to give these little babies a try. I can already see myself overdosing on a dozen of those bite-sized sandwiches! These look terrific. I am definitely trying these tomorrow. What fun! Wow, I totally love this blog. It’s so clean, professional looking, and I love the recipes to be found here! You totally have a new reader! It's been ages since I made homemade ones but your little bites are truly appetizing. Beautiful clarity of the pictures. I love bagels but have always been wary of making them myself. This recipe makes it seem easy and I am definitely going to try it soon! Thanks! Zembla, We attempt to shot all our photos in natural light (on our kitchen table), which on the other hand limits us to available daylight... No professional lighting setup. Molly, I usually stick with fresh yeast from my bakery (most bakeries sell fresh yeast, just ask them) or this brand. When the recipe calls for dry yeast, I use this brand or substitute it with fresh yeast (amount depending on the amount of used flour). Organic yeast is always a great option, too. Cathy, I'd suppose the dough could be made in advance, just make sure to punch it down properly before shaping the bagels, otherwise the bagels might become too fluffy. Although I can't tell from experience, I don't see a reason why it shouldn't work. Samara, Mini pizza bagels? What a great thought, this would combine two of my favorites... Please let me know, how they turned out! Maryam, No bagels in Marrakesh? How about trying your luck with this recipe then? Meena, The lurking danger of overdosing...hmm, been there...! The small size of a treat is always a welcome excuse for indulging myself far too much. Always. These were wonderful, thanks so much for the recipe! Only thing was the sesame seeds didn't stick at all - any hints on that? Just discovered your website and have to say it is fantastic! Will be back for more! I bookmarked four recipes I can't wait to try. what cuteness indeed! The problem with bagels specially for us watching our carb intake is that they are made needlessly too big. Bravo for bringing back some sense into this misunderstood breakfast food. I feel the same way, bagels are just too huge here in the US. You have found the perfect way to enjoy a bagel, I love your idea! Now come to the US and sell these beauties, you'd make a fortune! I tried making these just now...they turned out half as picture-perfect as yours (the poppy seeds refused to stick to the bagels) but were tres yummy! This are awesome! I love the photos too! Great job! The idea of the mini bagel is brilliant. Lou, Sarah, Glad your bagels turned out yummy! 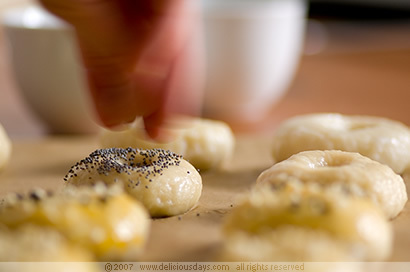 If you sprinkle the bagels with seeds right after releasing them from the water, their surface is still pretty sticky and you shouldn't have any problems, but you can always brush them with a little beaten egg yolk (will give the bagels a little yellowish color after baking) or egg white to enhance the stickiness. I made the bagels yesterday evening. They were delicious. 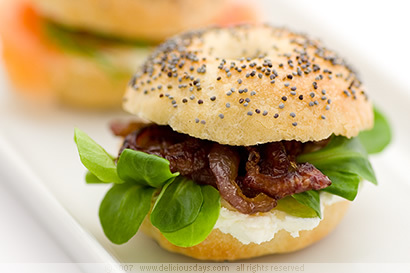 What is your favorite bagel topping? What is on the one on the picture? My favorites are a classic one with salmon/creamcheese or one with Pastrami/creamcheese/mustard. But I would like some good suggestions. I made the bagels yesterday and again today. They were easy to make and delicious! I posted about the experience here. Many many thanks! Maaike, The bagels on the picture are both topped with cream cheese. One with additionally with smoked salmon and dill, the other with lamb's lettuce and balsamic-caramelized red onions. I also love a spicy jalapeños spread with chicken or turkey! These miniature bagels are adorable and your photography is just breathtakingly beautiful! Great job! Humble Pie » Blog Archive » Miniature toaster wanted. 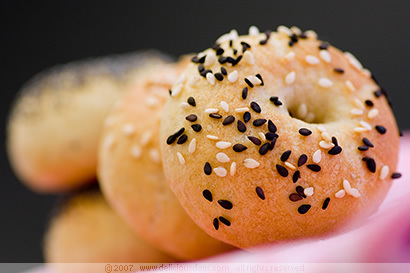 I made these mini bagels, and they turned out fantastic - I even blogged about them! Thank you so much for the recipe! Love your site! Strange, just days ago I randomly pulled out my copy of Fingerfood (dragged all the way here from California) and decided making mini bagels was how I was going to spend my Sunday night... it must be just a mini bagel time of year in Haidhausen! OMG! As if the mini-doughnuts I saw on not martha wasn't enough. I want to make them so badly! While I will take everyone's word that THESE bagels are delicious, lots of hotels that cater to the business traveller have a serve-yourself continental breakfast that includes "mini-bagels". They are the most tasteless, dry, un-bagel-ly things. Do not eat a mini bagel unless someone else will vouch for it. I have made bagels using honey and molasses, but only the ones that use barley malt end up having the right taste. Also, using barley malt gives them the right amount of shine. You can find the ingredient in places like Whole Foods and health food stores. It is sometimes used as an alternative sweetener, and is used in almost every commercial bagel recipe. Aran, Thank you for the tip, the recipe I used didn't mention barley malt, but now I'm keen on trying it! Will keep an eye out for it. Ich habe eure Seite grade erst entdeckt und bin schon süchtig! Setze ein Bookmark nach dem anderen, so tolle Rezepte, Dankeschön! Would like to ask what kind of white flour are you refering to (I used type 450)? How can I determine that the flour is 450 type? Another question, how many days can we store this bagels? Bella, I used plain 405 type (pastry flour) for mine, but am sure 550 (all-purpose flour) would work equally good. I would either freeze them straight away or keep them for one, maybe two days and toast them before eating. Stored longer they tend to get chewy. Well Nicki, I made them! This is a very big deal for me as I've never made any bread/dough product. Ever. And well, I think I screwed it up, but not so bad that they were inedible and I am inspired to try again, perhaps even today. I am so excited- honest, garlic bagels are my favorite breakfast food in the world and making them mini lets me 1. nibble all day and 2. have more garlic on each bite! Oh, and while its unrelated, I also made your brussels sprouts (the one with the meat and butter and bread crumbs and other general deliciousness?). Well Tom and I enjoyed BS for the first time. But we both think its because of everything except the BS! Either way- DD is the source of my fave recipes. x. Oh, and I"m going to try some pastry flour instead now... will let you know how it goes! Finally I made them! Yesterday was the big day. And they became GORGEOUS! I love them. Thank a lot for the recipe. Where can you buy a mini bagel toaster - saw one that was sent to Dr. Cindy Steven Wentworth in Boston - however no name or infor other than what describes this cute litte mechanism. Any infor., would be appreciated. These bagels are delicious! I just made my first batch and they turned out great. The outside was perfectly crisp and the center was nice and warm. I will make these again! I was wanting to add blueberries and chocolate chips to these how would I do that without messing them up? I'm just wondering if it would be possible to freeze the half-done bagels after boiling them in the saltwater? Or do you think they would be okay if I would boil them in the evening, put them in the fridge for the night and bake them in the oven the next morning? It would save me a lot of time in the morning if most of the pre-preparations would be done... What do you think? Hi Sini, Since I have never done that myself, I should probably not give any recommendations ;) But maybe these sites could provide better help (read the comments, too). Thank you so much Nicky! I will try it this weekend and tell you how it worked. Tested just right now (I made 12 pieces so I can make consistent sandwiches), I was impressed about how easy is this recipe for a great result, chewy and tender. Definitely approved. Thank you. Die hier sind einfach, meeeega niedlich und super lecker :) werd sie definitiv wieder backen!